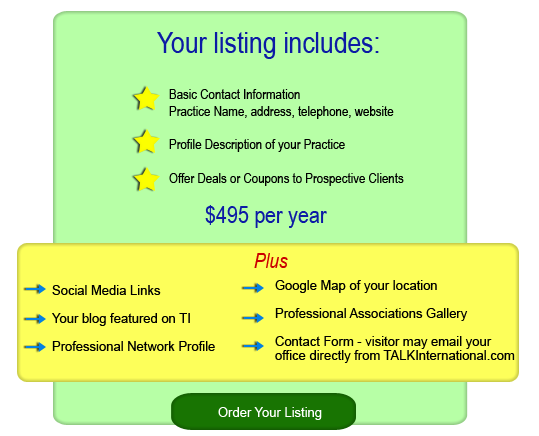 Why List Your Practice on TALKInternational.com? Ranks in the top 1.5% of all websites in the entire internet for number of visitors and number of pages viewed per visitor. Ranks well for on Google, Yahoo, etc., for search terms in the Holistic Dentistry, Biological Dentistry, and holistic medicine fields. We also rank highly in most Mercury Issue terms. Has been around for over TWENTY YEARS and has THOUSANDS of alternative health sites that link to us. Biological Dentistry is a research topic. Your prospective patients will likely be on a site that links to us when they decide to look for a dentist. Not only do we provide a free resource to consumers for health education, but we are actively involved in activities that promote the global ban on mercury in dentistry. Your membership enables us to get out there and make a difference. Our Members experience a significant increase in visits to their website. We also send more visitors to their websites than all the other resources. Our members benefit from exposure from our social media, press releases, and educational efforts both on and off our website. that our members receive great value and visibility in our directory.